UPDATED: Sun., Sept. 9, 2018, 8:48 p.m.
County workers roamed beaches and trawled offshore to collect the fish carcasses to head off decomposition as some beachgoers turned back. Rotting fish and the strong odor of the algae has previously repelled locals and imperiled Florida’s vital tourism sector for much of the summer. In August, Gov. Rick Scott declared a state of emergency and released funds to help with the massive cleanup effort and help businesses recover from lost profits. The algae has affected the coast in some way for 10 months – and has become a key political issue in the midterms for Scott, a U.S. Senate hopeful and Republican. The sudden approach of the algae bloom and dead fish washing ashore surprised beachgoers on Saturday. Andres and Veronica Bernal told the Times that they had checked county websites for alerts before leaving Tampa in the afternoon. Scientists are trying to figure out why, exactly, the current red tide along the Gulf Coast has been so protracted and deadly to wildlife. State officials and scientists point out that, at base, this is a natural phenomenon. 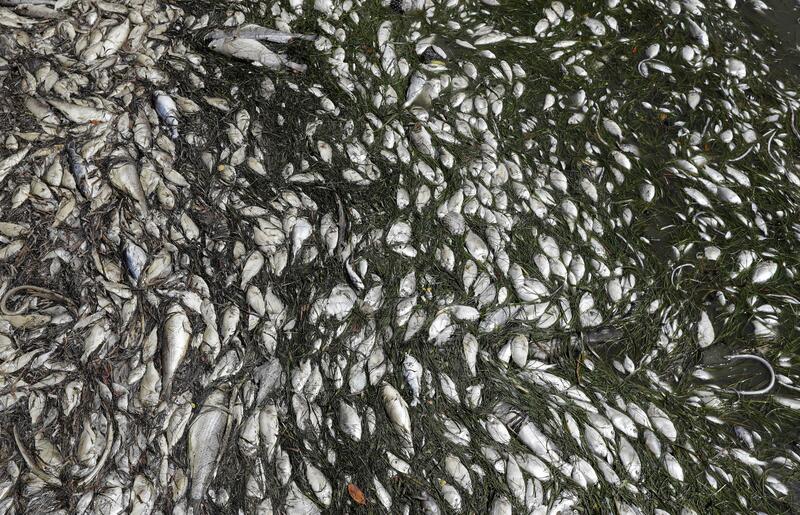 Fish die-offs were noted by Spanish explorers in the 1500s and have been well documented since the 1840s. The crisis has become a political issue in the upcoming midterms as Scott challenges Sen. Bill Nelson, a Democrat, for his seat. Both men have blamed the prolonged crisis and delayed responses on each other. Published: Sept. 9, 2018, 4 p.m. Updated: Sept. 9, 2018, 8:48 p.m.